For some reason, many people think footed pajamas are only for kids. If you are of a similar mind, I must say that I completely disagree. For some reason, many people think footed pajamas are only for kids. While it is certainly true that this type of sleepwear has traditionally been worn by young children, millions of adults across the world have slowly started gravitating towards these versatile pjs. There is nothing quite as snuggly on a cold winter night than a soft pair of adult footed pajamas; or feety pajamas as my wife calls them. With that being said, I wanted to build out a page that shows off a few of my personal favorites for adults and kids alike. 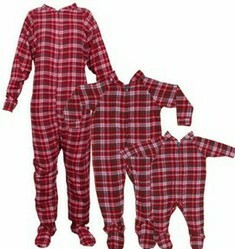 Of course, not everyone knows what they should be looking for when searching for their first pair of footed pajamas. It can be, in fact, rather confusing when you discover just how much flexibility there actually is. From comfort to fashion, and everything in between, here are a few things you need to be aware of as begin your search. This is perhaps the first thing you need to address. While my own personal preference leans towards single piece footed pajamas, my wife likes two piece ensembles. It really comes down to personal preference, but it is hard to beat the coolness factor associated one piece pajamas. Deciding whether to buy pjs with zippers, buttons, or snaps really boils down to who the sleepwear is for. Smaller children are probably better served by having simple snaps on the front while adults may opt for zippers or buttons; that way there is less chance for them to accidentally injure themselves. In my opinion, this is an absolute must for younger children; particularly if your house has tile or hardwood flooring. For adults, it really is a matter of preference but I like my feety pajamas without the extra treading. I actually like sliding around the house chasing the dogs. When it comes to comfort choosing the right material is crucial. Common choices include polyester, cotton, fleece, or flannel. Footy pajamas made from polyester are nice in that they typically do not require much care, but if comfort is your primary concern (like it is for me) then cotton is the way to go. Not only do they help keep you warm at night, cotton pjs also ‘breathe’ better which means you will sweat less…always a good thing in my book. While I typically call my footed pajamas just that, other people may have different names for the same product. A few of the more common names include footed sleepers, fetty pajamas, footy pajamas, footsie pajamas, pajamas with feet, and my personal favorite onesies for adults (so funny!). What is Your Favorite Type of Footed Pajama? Sure, footed pajamas may look like onesies for adults, but once you buy your first pair I can almost guarantee that you will be hooked. When it comes to comfort, you would be hard pressed to find something better. Plus, they look so darn cool! Footed PJ's are a treasure, everyone should have a pair or two of footed pajamas. This page is a keeper, great gift ideas for the entire family. Winter means flannel pajamas in my house and I love it. My flannel pj’s are just lovely and snuggly warm to see me through the harshest winter’s night.